Perhaps I am hoping against hope here, but I like to think that Julia Child would get on board the Meatless Monday train once in a while, were she still alive. I first became obsessed with the idea of a vegetarian take on her classic beef bourguignon several years ago after seeing Smitten Kitchen’s Mushroom Bourguingnon recreated on another blog. It kicked around my head for a long time before I finally whipped up my own version for a Valentine’s Day dinner party with some lady friends back in 2011. Agh! I can’t believe how long ago that sounds! Anyway, I added some lentils to mine for a little extra protein, and I’ve been making it that way ever since. This recipe is far from traditional (note the lack of butter), but I can promise that it is delicious and satisfying thanks to a generous amount of protein and fiber. It’s the perfect warming meal for a cold night, and it also happens to be a great excuse to open a bottle of wine. It’s often that thing I make when I just want to have a glass and need to justify opening the whole bottle. #SingleLadyProblems. 1.) Heat the one tablespoon of the olive oil in a heavy sauce pan or stock pot over high heat. Sear the mushrooms until they just begin to darken, (~3 minutes). Remove from pan and set aside. 2.) Lower heat to medium and add the second tablespoon of olive oil. Toss the carrots, onions, celery, garlic, and thyme. Season with salt and pepper and cook about 10, minutes stirring occasionally, until the onions begin to lightly brown. 3.) Add the wine to the pot, scraping up any bits that may have stuck to the bottom of the pan. Turn the heat all the way up and allow contents of pot to reduce by half (cooks off the alcohol). Stir in the tomato paste and broth/water. Add back the mushrooms and then the lentils and pearl onions. 4.) Lower heat and simmer ~ 20-25 minutes or until it reaches desired thickness. The traditional way to serve this is over egg noodles with sour cream and sprinkle with chives or parsley, but I actually like it over steamed greens like kale or spinach with some crusty bread on the side for dipping. It’s also delicious with some crumbled goat cheese on top. 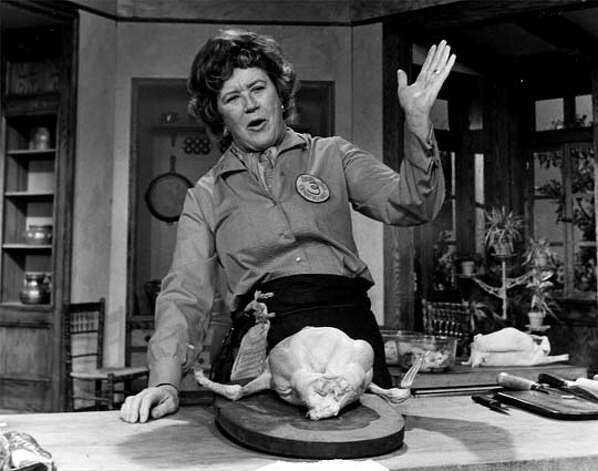 What do you think—would Julia Child be a Meatless Monday supporter? This entry was posted in Uncategorized and tagged cooking, Julia Child, lentils, meatless monday, mushroom, recipe, vegetarian. I’m a huge fan of meatless Mondays but I’m not too sure she would. Who knows! I’ve read a number of her books and she was not too interested in the health trends, which is probably why her health was so bad in the end. She refused to give up butter and cream, got to love her. The recipe looks divine though!